Death is hard, Edmund Kean is said to have said, but not as hard as comedy. What he neglected to say is that black comedy is even harder, because the literal-minded are tone-deaf to satire. 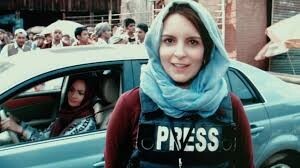 Glenn Ficarra and John Requa’s Whisky, Tango Foxtrot, a midnight-dark satire of war in general and the war in Afghanistan in particular, is based on a memoir by correspondent Kim Barker and stars Tina Fey as the newshen who stumbles into the country that has defeated every outlander since Alexander the Great. But then it got more interesting. Kind of like a satire that morphs into The Grand Illusion. I wondered about other black-comic war movies and naturally To Be or Not to Be and M*A*S*H came to mind . Yet in WTF the objectives are murkier than the former and not as uproarious at the latter. After Dr. Strangelove, are there other satires of war ?